While rehearsing for a play, Riker looses his grip on reality and finds himself in an alien insane asylum. I like that Riker is going undercover alone again, as he did in "First Contact." It's not a very comfortable hospital room, is it? It's more like a prison cell. The scene in which Riker first goes into the common area and meets Jaya, the woman who claims to be another Starfleet officer before proceeding to talk into her spoon like it's a communicator, is brilliant. "Don't let them tell you you're crazy." Jonathan Frakes has an impeccable sense of timing in this episode, knowing exactly how long to hold an awkward pause and how quickly to snap out of it, doing everything just twitchy enough to keep you unsettled. It's interesting that, during the "reflection therapy," Riker's psyche is represented by Troi, Worf, and Picard, since these are the three characters that Riker has the most dynamic relationships with. 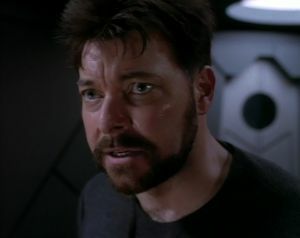 The ending is a little too neat and quick, and I hate watching Riker stroke his beard as if to say, "Ah yes, so that's what was really going on. How delightfully clever and interesting." This is about as dark as TNG gets, and though the tone and feel of the episode is far from the norm for Star Trek, it still retains in its DNA all the elements of a good Trek yarn. It's a puzzle show with a pretty standard Trek resolution, and it excels at showing a familiar character in a new light. This season has had several episodes that take a specific character into frightening territory, whether it's Picard being interrogated by Cardassians in "Chain of Command, Part II" or Troi finding herself forced into a deadly espionage mission in Romulan space against her will in "Face of the Enemy." Each of these episodes also forces the actors to stretch themselves, and all of them--including Jonathan Frakes here--meet the task with admirable results. We've never seen Star Trek confront the issue of mental illness head-on like this before--indeed, mental illness rarely ever comes up on the show in any form--but here it does a good job demonstrating how fragile a psyche can be. Number of episodes in which a member of the crew is subverted by an alien lifeforce: 25.